What role does matter have in the universe? PART A: How are observations different from inferences? PART B: In what ways can matter be classified? PART C: In what ways might matter change state? In what ways might matter and energy have a role in the universe? Collect Entrance Slips, Exit Slips, and Science Journal to check for student understanding and student reflections. Teacher can alter lessons according to the level of student understanding. To be inclusive of all learners, adaptations and extensions are provided for each lesson in the Learning Events (see each lesson). Basic facts about the states of matter, explanations of the molecules in the state of matter, and phase changes will be provided with text, visuals, and video links. In addition, to including hands-on experiences, access to visuals, and technological resources during each lesson. Also, students may be encouraged to work in pairs/groups to be able to discuss their ideas and brainstorm. Allow for choice of performance/product: writing, comic, iMovie, oral re-telling, printed on the computer, etc. Activities will also be available for students to use time to inquire into questions about matter. Grade 3-6 Properties and Behaviour: Matter & Energy by Evan-Moor Corp.
Grade 4-6 Simple Chemistry by Evan-Moor Corp.
Observations and Inferences are not the same thing. Phase changes are physical changes, not chemical changes. 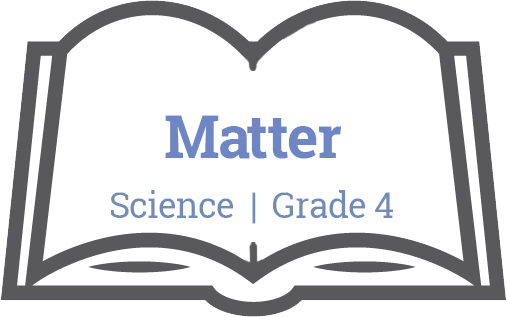 This unit introduces the concept of matter to grade four students. When the unit is complete, the students will be able to use appropriate scientific terminology to explain that the world around them is made up of matter and how it can change. During this unit, students will be able to independently use their learning to hypothesize, observe, infer, classify, and communicate findings. This unit can be taught before or after the grade four science unit on energy; both of the units can be combined by focusing on the main understanding that everything in the universe is made up of matter and energy. Energy is a property of matter and can be transferred between objects and converted in form, but it cannot be created or destroyed.